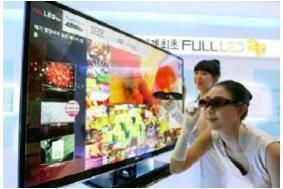 KOREA: LG, Samsung aim upmarket to reinforce their TV market lead | What Hi-Fi? Both are increasing production of what are seen as premium-level sets, with features such as LED backlighting, 3D and internet TV, and in so doing aiming to increase the popularity of such features – and of course their total sales. Samsung sold almost 31m flatscreen TVs last year, with LED-backlit sets accounting for 8.4% of those sales, and earlier this year it set itself a sales target of 39m TVs, with more than 10m of those destined to have LED lighting. However, industry analysts expect the proportion of LED sets to be even higher, perhaps as much as 30%: indeed, of the just over 9m sets it sold between April and June this year, more than 30% used LED backlighting. LG has also upped its targets for 2010: it original said it wanted to sell 12m flatscreen TVs this year, including a million with LED backlighting, but it's now shooting for 17m sets in total, or which around 6m will be LED models. And TV industry research company DisplaySearch says the moves will help the two maintain their dominance in the global TV market, which is currently growing by about 21% year-on-year. It says that Samsung is expected to take a 27% share of the TV market in the second half of this year, with LG hot on its heels at 26.2%. That will give the two a joint market share of 53.2%, up 3.4 percentage points on the 49.8% they achieved in the first half of the year. It's expected this strong grip on the market will continue well into 2011.